Moths don’t typically build nests -- pr places to live, take shelter and bear young. During most of their lives, whether as moths or during the larval stage as caterpillars, these insects move around in search of food, sheltering when necessary in convenient places such as underneath leaves or in doorways or the cracks of buildings. The closest that moths come to nesting is during their pupal stage, when most moth species build cocoons to protect them during metamorphosis. The life cycle of a moth includes four main stages. The adult butterfly lays eggs, out of which hatch larvae called caterpillars. The caterpillars go through several periods of growth and molting referred to as instars. The final molt brings the caterpillar to the moth's third life stage, the pupal stage, during which it undergoes metamorphosis and transforms into an adult moth, the fourth and final stage of development. It is during this third stage that the moth pupa typically wraps up in a cocoon and remains stationary while metamorphosis takes place. Most moth caterpillars build their cocoons by spinning silk around themselves. The great silkworm moth uses only silk for its cocoon, but some moth species also incorporate other materials, such as bits and pieces of leaves or hair from their own bodies. Other caterpillars roll themselves up in a leaf and use their silk to seal it shut. These cocoons are sometimes attached to the underside of a leaf or twig, although sometimes they can be found lying on the ground. Clothes moths, bagworms and other case moths, such as the Saunder’s case moth in Australia, build cocoons around themselves at the beginning of their larval stage, leaving them open on top so that they can move around and access food. These caterpillars carry their cocoons with them wherever they go, adding material to them as they grow. When they reach the pupal stage, they attach themselves to a leaf, twig or branch before closing off the opening and sealing themselves inside. The exception is clothes moths, who typically live indoors. These caterpillars usually either find a crevice in which to hide their cocoons or attach them to a piece of fabric. Not all moths build cocoons during their pupal stage. Some bury themselves in the ground when they reach the end of the caterpillar stage. These are univoltine moths, meaning they produce one generation per year. Often, these moth pupa will overwinter underground, remaining until the warm summer months, when they emerge as adult moths. 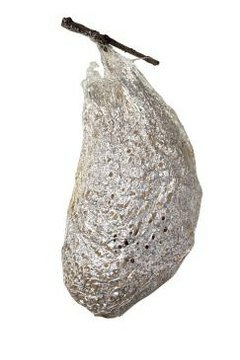 Cocoon.org: What Is a Butterfly or Moth Cocoon?